I lost most of my sense of smell over ten years ago, which means that I can discern taste but struggle with aroma. Like many people suffering from anosmia, the scientific name for loss of smell, I’ve slowly embraced bolder flavours that titillate my taste buds to make up for my indifferent nose. 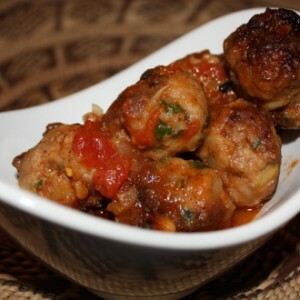 Thai cuisine has become a favourite, along with Indian, Mexican and Sichuan. 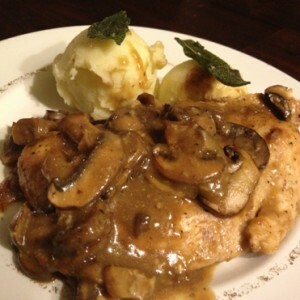 Sometimes, I can’t even remember when I ate steak or vichyssoise last. Along with spicy-sour Tom Yum soup that straddles Thai and Laotian cuisines, Tom Kha Gai soup is a staple of Asian menus. Its name literally means “Chicken Galangal Soup”, i.e. Tom (boil/soup), Kha (galangal) and Gai (chicken). 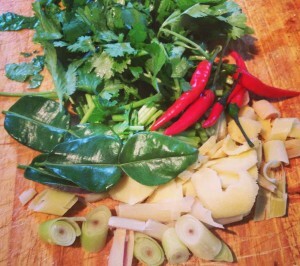 Its ingredients are quintessential Thai: coconut milk, lemongrass, ginger or galangal, lime juice, bird’s eye pepper, fish sauce, kaffir leaves and cilantro. The inspiration for this recipe came from a demo of The Boss by Breville blender I attended last fall, which I present here. I tweaked it for cooking in a pot rather than a super blender that does all the work for you, even heating the soup. Delicious, fresh and spicy at the same time, this soup adds layer upon layer of flavour to get every single one of your tastebuds tingling, whether they vibrate to the tune of acid, sweet, spicy, salty… or umami. The trick will be, in fact, to find the exact play of flavours you like best from the usual list of suspects below. Do you prefer it more sour? Add more lime juice. More salty? Add more fish sauce (although not too much, its pungency can quickly overpower a dish.) You’re a chili head? Then by all means, squash or halve those bird’s eye pepper to draw out their spiciness. Tom Kha Gai isn’t meant to be extra spicy but rather to gently warm and comfort. Without a little heat, though, it would miss the mark, so do explore your inner chili geek. If your guests dislike spicy foods, you can just use less bird’s eye peppers when cooking, then proffer homemade or store-bought chili oil to drizzle when serving. We all have our favourite brand. 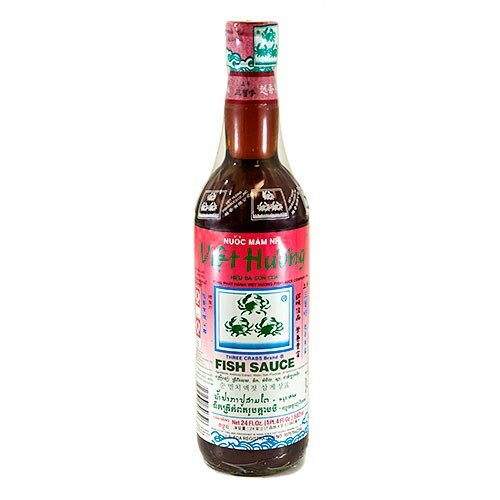 I always buy Viet Huong Three Crabs Fish Sauce, or Nuoc Mam as it’s commonly called. The greatest complexity attached to Tom Kha Gai soup may be finding the ingredients close by, otherwise you may have to improvise and substitute. While no ingredient can truly replace the galangal which gave its name to the soup, you can use ginger, purists be damned. Yes, it will detract from the traditional taste of Tom Kha Gai but produce a delicious, vibrant soup nonetheless. Same goes for kaffir lime leaves, which can be replaced by lime zest and juice (I draw the line at using anything dried though, so I guess I have my purist peeves). 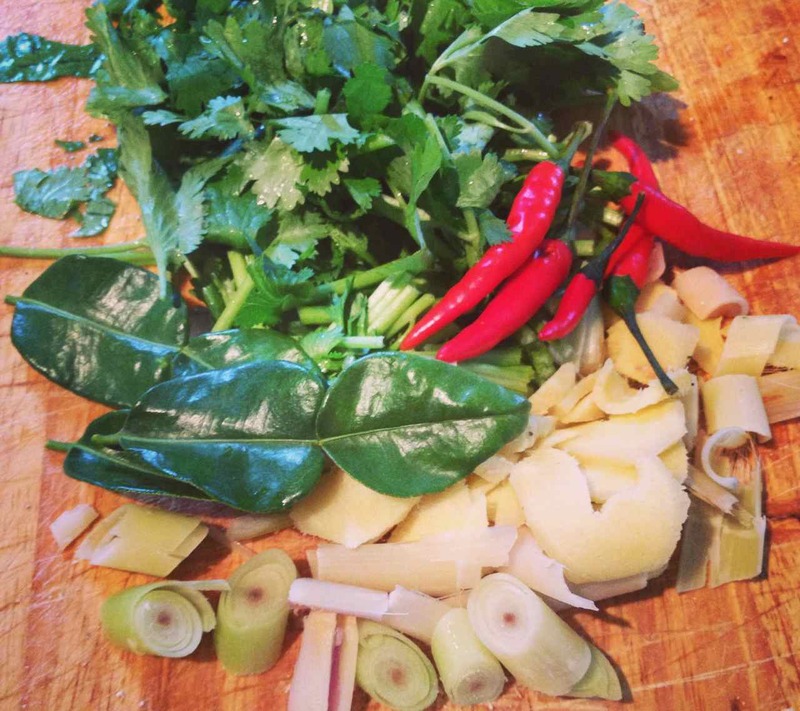 Clockwise from the top: cilantro, bird’s eye peppers, chopped lemongrass, sliced fresh ginger, green onions and kaffir lime leaves. Overall, this is a very easy recipe, requiring around 30 minutes to prepare and cook, and no more complicated than a traditional cream of vegetable. 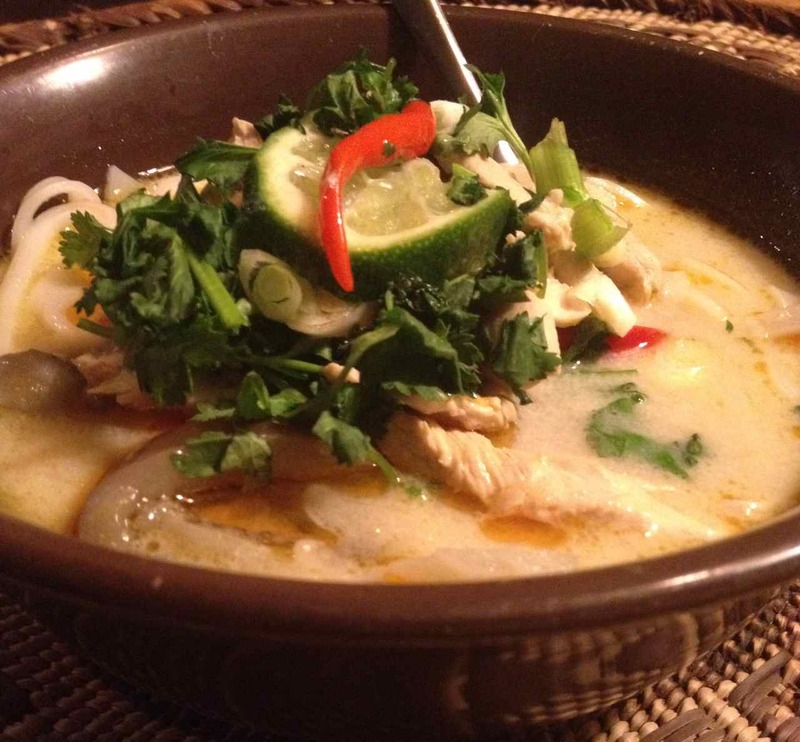 If you’re not familiar with Thai cuisine, or loooove it but are afraid to risk it, this pretty soup is a great place to start. Taan hâi a-ròi! 2. Using a fine sieve, strain broth, pressing on aromatics to extract as much flavouring as possible. 3. Return broth to pan, add in coconut milk and sugar. Warm up to dissolve sugar, without boiling. 4. Add chicken strips and your choice of vegetables: baby corn, sliced fresh mushrooms, red bell pepper strips, fine sliced eggplant, etc. Over medium heat (without boiling because of the coconut milk), cook 10 to 20 min or until chicken is done and has lost its pinkish colour. 5. Add in as many bird's eye peppers as will thrill your taste buds. Cook 5 minutes. Mix in lime juice and fish sauce, then heat again 1 minute over low heat. 6. 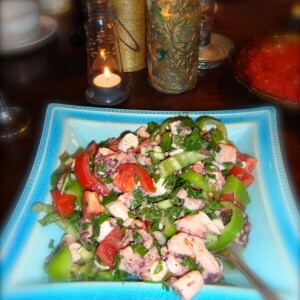 To serve, garnish with fresh cilantro leaves, lime wedges and chili oil.